Magento 1.7 that was the most popular e-commerce platform in 2012 with customer group based pricing, coupon code auto-generation, bank transfer payments, email logos, CAPTCHA and so on. It was radical improvement of e-commerce platform at that time. After 8 years of developing, Magento is developing continuously with grandiose support for online stores. Magento 1.9 is the last version 1.x of Magento. You have using Magento 1.7 since 2012. Now, you want to upgrade magento to enjoy new features. Magento 1.9 is last version of Magento 1.x with a lot of powerful features that makes your online business successfully quickly. Amazing features are financing and payment solutions, security and UX, you can learn more at magento upgrade 1.9. Magento 1.9 is friendly with users of Magento 1.x, from 1.4 to 1.8. - Create the database same as current magento 1.7. Then download magento 1.9 from Magento Commerce. - Take the your theme and skin from old version to new. Then after check one by one-third party extension from old to new. I did it and it will work for me. Unfortunately, this way hides many errors that can happen anywhere. It requires dev technical knowledge about Magento migration. Migration expert advices clients and dev to seek help from migration developers or migration providers. 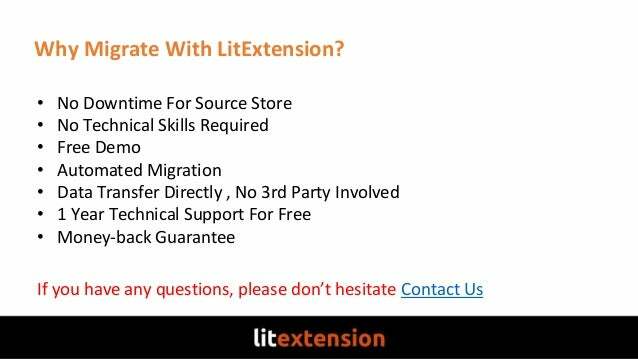 Magento upgrade service of LitExtension is a striking example. Beside magento 1.9, e-merchants can choose Magento 2 that is the last version of Magento. It is required deep learning-circle. Here is how to upgrade magento 1.7 to 2.0. Make a right choice and enjoy new online store with LitExtension!